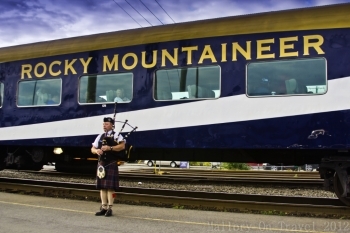 The Rocky Mountaineer in British Columbia, Canada is one of the World’s great locomotive train journeys. 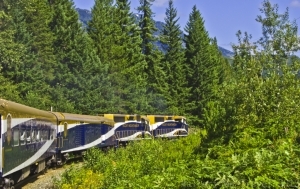 Although I am not a great train buff I do enjoy travelling by rail and taking this special train from Vancouver to Whistler and back was another milestone in my life as a traveller. 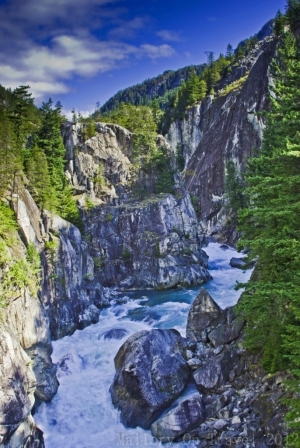 This particular journey is considered a particularly special Rocky Mountaineer route; the scenery is stunning and of course terminates in epic Whistler. As I had never visited the adventure resort it was another highlight of a great trip. Rail travel where it is possible is preferable to taking a plane for many travellers. It is more carbon friendly, the slower means of travel is relaxing enabling the passenger to enjoy the views and avoid the hassles of airports and security checks. I am also drawn to the romanticism of rail history, steam locomotives and the adventurous spirit of the pioneers that built the great railroads crossing vast expanses of open land. They blasted tunnels through whole mountains, built impressive rail bridges across mighty rivers and laid mile upon mile of track through some of the World’s greatest wildernesses, thousands of men involved in the back breaking labour. It maybe a somewhat flawed perception but it is the imaginative inner child in me that it appeals to rather than the more questioning adult. 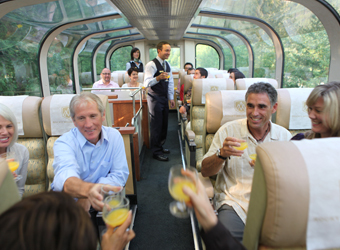 Taking the Rocky Mountaineer is a full on luxury experience, which even includes collection directly from the major hotels in Vancouver. My own particular experience was the newly introduced ‘Silver Leaf’ Sea to Sky Climb Dome Service which includes overhead windows and a meal in the seat. It provides great views and is extremely comfortable but of course taking pictures through a window poses a few difficulties. For this reason as soon as the meal was finished I made my way to the open car where unobstructed views are possible. It is perfect for taking pictures and unsurprisingly can get a little crowded. It does mean missing the enthusiastic and pleasant commentary of the train staff. Throughout the journey they provide passengers with detailed descriptions of the major sights and a few of the stories or myths behind them too. The views from the open car however are worth it. 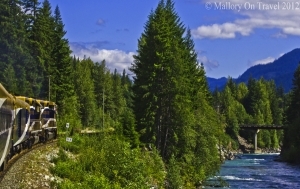 Kodak moments are lined up along the route, every few miles there is stunning vista or interesting scene. A pleasant surprise was that everybody seems to wave at the train as it passes. Villagers stand on their porches or in the gardens, they wave from cars, boats and buses, while waiting at level crossings or bus stops, everybody seems genuinely seems pleased to see the train. Small but perfectly formed waterfalls or spectacular mountain scenery with huge rock walls and climbers testing their skill on recognised routes or creating their own line up the sheer faces. Idyllic little coastal coves where small boats are often moored, their owners hoping for the salmon of a lifetime to take their bait. Passing through small towns like Squamish which is squeezed between the ocean and the mountains, it almost seemed a shame not to be able to stop here as well. It appeared to be a great little town and a great place to experience all that both environments have to offer. There was plenty more just crying out for a lens to be pointed at, logger boats herding the lumber in small inlets or the powerful, tumbling white-water of fast flowing rivers. At one point we crossed a bridge and all that we could see was the edge of an obvious huge drop of a cascade. It is a trip filled with jaw-dropping scenery and the added excitement of bald eagles soaring high overhead or even the possibility of seeing a bear. Taking photographs from a moving train provides its own special challenges, ensuring a sharp image can be difficult and usually requires a fast shutter speed to capture the subject. The train driver helps whenever possible, the train is slowed at most of the major highlights and the passengers are warned which side to aim their cameras at. 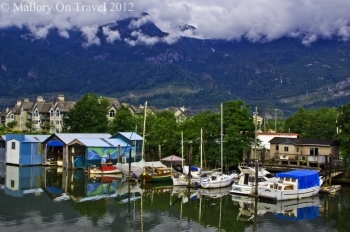 Arriving in Whistler which was to be the next great adventure on my trip was exciting and more of that later. However this is one journey which really is as special as the destination. 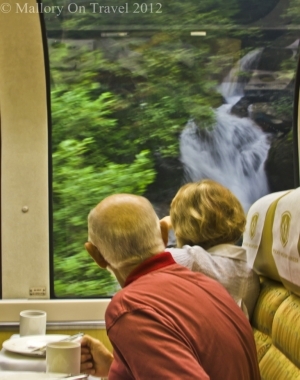 Rail travel really is as romantic as it is perceived to be and this journey between two of Canada’s great destinations has piqued my appetite for further rail adventures. If you enjoyed this story by Iain Mallory go to his website for more great adventures.